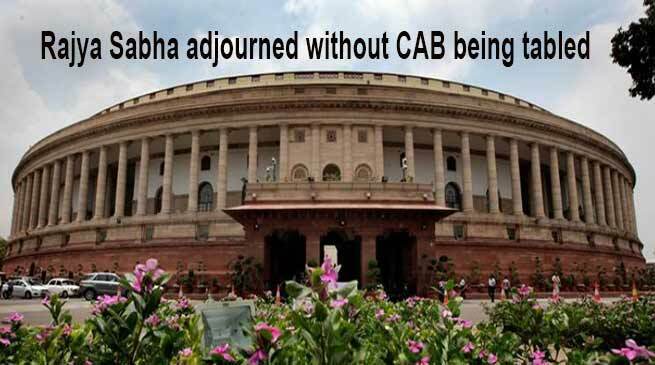 The Rajya Sabha saw repeated disruptions on Tuesday and was adjourned and Citizenship Amendment Bill ( CAB ) could not be table in the Rajya Sbha. The Rajya Sabha was on Tuesday scheduled to discuss the motion of thanks on the President’s address. The government may extend the Upper House sitting by a day or two to complete the legislative business which includes a discussion on the Budget and a few other bills including CAB . Protests against the citizenship bill continued in the northeast states , which is likely to be tabled in Rajya Sabha today. Protests against the citizenship bill continued in the northeast states even as regional political parties rushed to New Delhi to make a last ditch effort to stall the proposed amendment, which is likely to be tabled in Rajya Sabha today. The proposed amendment which was passed by the Lok Sabha in January would relax citizenship eligibility criteria for Hindus, Sikhs, Parsis, Jains, Christians and Buddhists who have come from Afghanistan, Pakistan and Bangladesh. Arunachal Pradesh’s Pema Khandu and Manipur’s N Biren Singh urged Home Minister Rajnath Singh to ensure the bill was not passed in Rajya Sabha. In Manipur, mobile internet services have been suspended and curfew imposed in the twin districts of Imphal (East) and Imphal (West), according to police sources. Rajya Sabha has been adjourned till tomorrow (February 13) as uproar continued over Samajwadi Party (SP) leader Akhilesh Yadav’s episode at Lucknow airport.